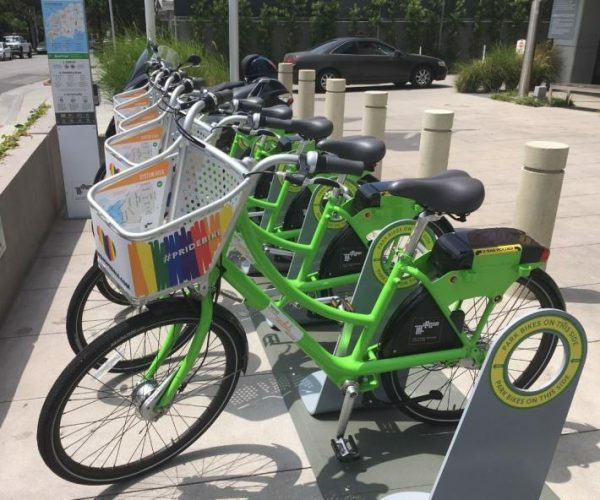 West Hollywood will put the brakes on its WeHo Pedals bike-sharing program if the City Council on Monday approves a proposal by council members John D’Amico and Lauren Meister. A memo accompanying the proposal suggests the city instead test a dockless bike share program like those being evaluated currently in Santa Monica and Los Angeles. The dockless bike share program would be operated by a for-profit company and not subsidized by the city. The memo calls out a January 2018 report from City Hall that says that over 12 months WeHo Pedals cost the city $344,750 and generated revenue of only $133,771. The city had anticipated revenue from those who used the 150 rental bikes and from advertising on the 21 stations where they are located. It notes that while WeHo Pedals was expected to generate 263 trips per day, it only generated an average of 40 per day over a 12 month period at an average cost to the city of $25 a trip. WeHo Pedals has a number of pricing plans, including one that charges $7 for the first hour of a ride and then 12 cents for each minute after, and one that charges $99 a year for a rides of up to 90 minutes per day. A dockless bike share program would allow private companies to offer shared bicycles for rent on sidewalks and private property with a license from the city. The bikes would not need to be locked to a standard rack or be located at designated stations or hubs. They would be accessible via a mobile app through which the user could pay for his or her ride. In both Los Angeles and Santa Monica operators of dockless transportation vehicles pay the city an annual fee of $20,000 and $130 per device. Los Angeles also requires those operators to share data on the usage of the vehicles and to provide access to those without smartphones and those with low incomes. The operators will have to have liability insurance of at least $5 million that covers both the companies and their customers. The proposal to the city council states that closing WeHo Pedals could save the city $400,00 a year and that the city might be able to recover some costs by selling the bikes and other related equipment. The City Council will meet at 6:30 p.m. on Monday in the City Council Chambers, 625 N. San Vicente Blvd., south of Santa Monica. Parking in the adjacent five-story parking structure is free with a ticket validated at the council meeting. CORRECTION: An earlier version of this story said the average cost per trip of West Hollywood’s WeHo Pedals program was $7. The actual cost was $25 and the story has been corrected. From beginning these useless bikes were a public relations ploy, playing into the Duran Dream of New Urbanists flying in from Paris and after breakfast in New York, cycling through West Hollywood. Gimme a Break. They sit alone waiting for a rider. Dockless bikes and scooters are the latest mechanized version of litter for the lazy. Just leave it anywhere and take no responsibility. Walking would surely improve one’s life. Whatever the city considers and eventually authorizes, please require it to be equipped with some type of bell/horn and lights…..not the intimidating and blinding light on current scooters which is like a permanent high beam on a car. Such local government programs demonstrate only one thing: that the city of West Hollywood is overfunded and seeks (in most cases useless) projects to fund with taxpayer money. De-fund the city of West Hollywood! What really gets me is the city bought into and put these bikes all over town all at once without any trial period or public test–literally hundreds. Why didn’t they start with just a few at key locations to see how it went? No one wants to ride the bicycles. Get your act together Weho! Why is WeHo really not approving the eScooters? What happened to being the creative city and moving forward? This is comical, to say the least. The council was way too late to bring a bike program to the city which had worked in many other major cities such as NYC and Miami 5 years ago. Now they are thinking a dockless mobile, which will allow a bike to be parked anywhere the same complaint as scooters along with people riding a bike on the sidewalk. Humm, there are clearly no signs of sanity returning anytime soon here. However, what is even more comical, is why would I or anyone else pay $7.00 for the first hour, only being able to stay in Weho, when I can pay half that for a scooter and complete my commute to the Redline station at Hollywood and Highland? Once more this council has no reality with the economics of the market! The only ones making money are (1) the bike manufacturers and (2) the bike & ride companies selling this rediculous and misguided concept of local bike transportation to local government agencies seeking alternative sources of income and transportation solutions. If West Hollywood wants to help lower income people get around town there are more credible alternative ride share solutions that don’t bleed money from city coffers and require implementing unsightly infrastructure. The birds scooters killed the bike program but I do agree w Alan that government programs are not run for profit. A small loss with increasing ridership might take 2 or 3 years to break even. No bikes means more scooters? Please let’s have some enforcement of these scooters on sidewalks and all over the place. Sorry Larry. This program was dead way before scooters. Government programs are not run for a profit, or even to break even, government programs serve the public good. We subsidize public transportation for myriad reasons, all having a root in societal benefit, including providing options to low-income folks, to those who see the environmental benefit of options other than a car, and importantly in this city, to have fewer cars clogging the roadways. Let’s get over the dollars and cents analysis and focus on whether or not there’s a public good in having sensible transportation options such as shared bike programs. I’m even a supporter of the scooters, but our regional experience of scooters has been marred by bad apple riders who ruin an otherwise good idea, thus losing the public relations efforts for the companies that provide the devices. We have a big city bureaucracy (and a handsomely paid one at that) which can and should find solutions that work for everyone. Keep the bikes, in some form. I agree with Alan but I would add this to consider. You can’t ride them out of West Hollywood so this limits your trip to basically Santa Monica Blvd. I wrote to WeHo Pedals in the beginning suggesting that a docking station at Hollywood and Highland would be a good idea. I assume the new dockless bike program will also have the same limitation. The Metro Bike Share program which has stations all over Los Angeles would be a better fit. Let them maintain it and they have electric bikes too! Scooters aren’t bad, it’s the on-demand nickel and diming and lock-less technology business model that corrupts the product. Slow down, take it all in……Try walking. Get rid of those stupid bikes. They take up space and I hardly ever see people using them. Most likely because the pricing structure is too ridiculous in the first place; it’s just too expensive. I’m much more of an advocate of a *regulated* scooter program like Bird, Lime or Lift. They’re actually fun to ride, cost effective and encourage locals to consider alternative methods of transportation. Scooters can never be “regulated”, it would defeat their purpose of a reckless and throw away joy ride. This local is very content with walking. I certainly hope that if they adopt dockless bikes that we don’t have bikes laying all around like we did (and still do) the scooters. Having to dock them at least keeps them from becoming clutter and a nuisance in our neighborhoods and city. I appreciate the city trying this concept. It just didn’t work. And it’s not the cities fault, though they were too pricey and needed a sponsor. Let’s move on from it. Meister seems to have no problem with the heavy subsidy of Cityline and Dial a Ride. At least the bikes are good for the environment. I’m guessing nobody’s grandma will be using a scooter to get up our hills. Yes Councilmember Meister has no problem funding Cityline and Dial-a-Ride! Thank you. Those programs are effective and heavily used by our senior and disabled comunity. According to Wehoville’s reporting, the City spends $44 per trip for a Dial-a-Ride trip, and ridership is about the same as those that use Weho Pedals but more than six times the cost. CityLine trips are subsidized $13 per trip – still more expensive than the bikes, which are not contributing to more pollution and traffic. I am not saying that these transit options should be banned but we should be honest about the “effectiveness” of taxpayer money. Obviously, Meister doesn’t want to mess with the very expensive subsidies targeting older voters due to self-preservation. West Hollywood’s older population deserves that service. West Hollywood has a huge surplus of money, tax revenue from visitors every weekend, and from people staying in hotels. I have zero problem with them giving money back to take care of our senior population. And I don’t care if people see it as politically motivated. I’m proud to live in a community that takes care of our senior population. WEHO could use a few less “creative thinkers” and a few more “practical analytical thinkers” with the ability to anticipate. With department heads and planners always resorting to outside consultants we are often left with unworkable and/or impractical solutions. It is questionable as to whether or not any of the Long Range Planning folks qualify in this regard. Well said! For the amount spent on WeHoPedals the city could have bought a bicycle for anyone in West Hollywood who needed one.